In the post-World War II USSR, a group of scientists led by Mikhail Tikhonravov at the newly created NII-4 military institute pioneered the work, which would ultimately lead to the first Soviet artificial satellite. This effort prepared ground work for the political decision to go ahead with the launch of Sputnik. A decree of the Soviet government No. 149-88ss formally authorizing the development of an artificial satellite was signed on January 30, 1956. It called for the development of an unoriented satellite, designated Object D, during 1957-1958. The spacecraft's mass was limited to 1,000-1,400 kilograms, relying on the capabilities of the R-7 ballistic missile. Between 200 and 300 kilograms were available for scientific instruments. The launch date was set for 1957. By the end of 1956, it became clear that problems in the development of the scientific instruments for Object D threatened to derail the schedule. To meet politically important window, OKB-1 proposed the Soviet government an offer it could not refuse -- to precede Object D with a "prosteishy sputnik," or "simplest satellite," also known by Russian abbreviation as PS. With the launch mass of "only" 80-100 kilograms, and it could be launched in April-May 1957. A version of the R-7 rocket, which was destined to carry the first satellite into orbit, carried a rather long designation -- 8K71PS No. 1 M1-PS. It featured several upgrades deferring it from previous R-7 test vehicles. Along with the military warhead, gone were measurement hardware, top avionics section containing vibration monitoring system, cables connecting the rocket and the warhead and the considerable portion of the flight control hardware, including radio control system. To support first satellite launches, the Soviet government approved a number of upgrades to tracking facilities and to the hardware originally built for ballistic missile tests. As the original satellite development program was designated Object D, the index "D" was added to the names of systems supporting the mission. On the eve of the Sputnik launch only part of the tracking systems originally planned for the Object D project were ready for work. On Feb. 15, 1957, Korolev signed an agreement with NII-885 led by Mikhail Ryazansky on the specifications of the radio transmitter for the PS satellite. It would be the the main component of the spacecraft to be developed outside Korolev's OKB-1. The launch vehicle with the PS-1 satellite blasted off on October 4, 1957 at 22:28:34 Moscow Time. (250) (It was already October 5 in Tyuratam.) Before the satellite completed its first orbit, TASS, the official Soviet news agency, announced the launch to the world. The flight controllers intentionally left the Tral telemetry system onboard the core stage active and its signal was detected during the second orbit. Depending on the ideology of the viewer, a Soviet-made star in the sky, could simultaneously represent an imminent nuclear holocaust, a hope for the oppressed and dispossessed, or the dawn of the interplanetary travel. The enormous resonance of the Sputnik launch was also thanks to the multifaceted nature of this single event and its ability to simultaneously break so many assumptions, long-standing theories and even entire political strategies. Tikhonravov, Mikhail Klavdievich (July 29, 1900 - March 3, 1974). Involved in pre-World War II studies of rocketry in the USSR, Korolev, like many of his colleagues, went through Stalin's prisons and later participated in the search for rocket technology in occupied Germany. He deserves the most credits for turning rocket weapons into an instrument of space exploration and making the Soviet Union the world's first space-faring nation. Keldysh graduated from Moscow State University, MGU, in 1931 and worked for Central Aero-Hydrodynamic Institute, TsAGI, and MGU, where he became a professor in 1937. During his work at Steklov Applied Mathematics Institute, Keldysh led a group of researchers tackling mathematical problems of space flight. As member of the Presidium of the Academy of Science from 1953, Keldysh provided major support for the satellite project within the scientific establishment. Ustinov, Dmitry Fedorovich (Oct. 30, 1908 - Dec. 12, 1984). Although he had no involvement into rocket industry until he won struggle for power in the USSR, Khrushchev quickly "fell in love" with rocketry after meeting Korolev, Chelomei and other key figures in the field. Initially, he saw rockets purely as weapons, which would give him an equal footing in negotiations with the West. 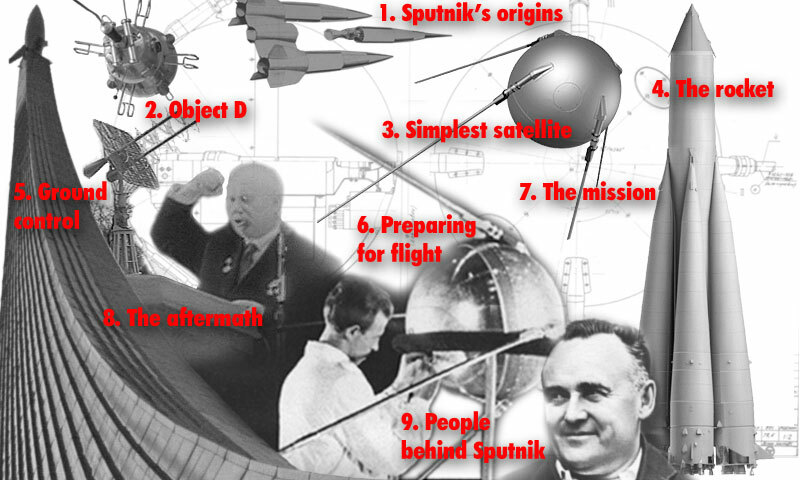 However Sputnik's triumph showed Khrushchev unmatched propaganda value of space program. Khrushchev had strongly supported space exploration projects, until his fall from power in a bloodless Kremlin coup of 1964.